Europe's aviation safety agency has issued a new warning about the risks of carrying large numbers of electronic devices in checked baggage. The European Aviation Safety Agency issued the safety bulletin just two weeks after the U.S. and U.K. banned passengers on several airlines from the Middle East and North Africa bringing any personal electronic device (PED) larger than a smartphone into the cabin. "PEDs containing lithium batteries are considered as dangerous goods. When carried by passengers, they should preferably be carried in the passenger cabin," the EASA said. U.S. administration officials said the ban was necessary because intelligence suggests terrorists are now able to hide explosives in laptops and other devices. But the EASA, which promotes aviation safety across all 28 European Union member states plus Switzerland, Norway, Iceland and Liechtenstein, suggested the ban could exacerbate another risk. "When the carriage of personal electronic devices in the cabin is not allowed, it leads to a significant increase of the number of personal electronic devices in the cargo compartment," it said in a statement. "Certain precautions should therefore be observed to mitigate the risk of accidental fire in the cargo hold. In particular, personal electronic devices placed in checked baggage must be completely switched off and well protected from accidental activation." 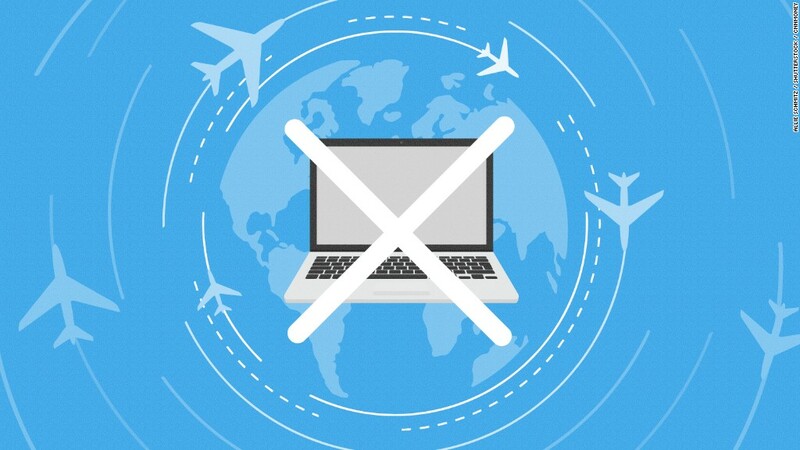 The aviation industry has slammed the laptop ban. The head of the International Air Transport Association, Alexandre de Juniac, told CNNMoney last week that it wasn't an appropriate solution to the threat, would hurt the airlines affected, and should be overturned. Some airlines have tried to ease the headache for passengers by allowing them to hand in their electronics at the boarding gate for stowage in the cargo hold. But that too surprised safety experts. "Having them all stacked together goes against the regulations of [lithium] ion transportation that limit how many batteries you can ship together," Doron Myersdorf, CEO of StoreDot, told CNNMoney last month. Other countries have so far shown no indication that they'll adopt similar restrictions to those imposed by the U.S. and U.K. But more airlines and passengers could be drawn into the net -- the Department of Homeland Security said this week that the restrictions could be extended to other airports. The risk of carrying lithium batteries in large numbers is well documented. Two Boeing 747 crashes -- a UPS freighter in 2010 and an Asiana Cargo plane in 2011 -- happened after fires broke out in the cargo holds. Those were traced to palettes of lithium ion batteries the planes were carrying. The International Civil Aviation Organization advised global regulators last year to ban carrying bulk shipments of such batteries in the cargo holds of passenger jets. --Samuel Burke contributed to this report.